Lydiah is the second born in a family of 5 kids. Her elder brother completed his primary education three years ago, but was unable to join secondary school due to unpaid school fees. 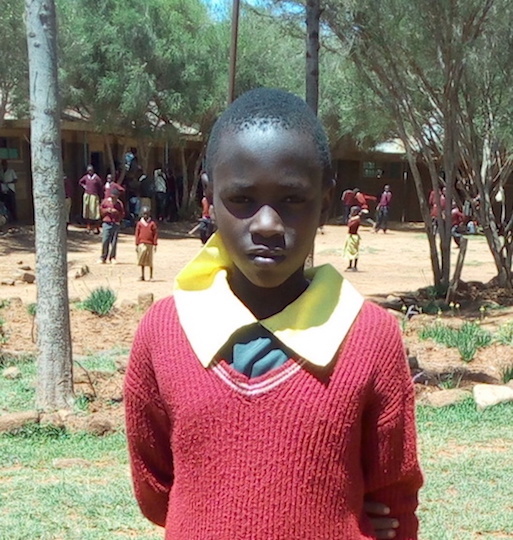 She is a top-performing student and is always one of the top five students in Mururku Primary School’s class 8. She has always maintained a total of over 300 marks, and our last follow up with her showed that she has improved her grades even more, now maintaining her average at over 340/500 marks. This improvement serves as proof of the desire and motivation she has to advance her education. She aspires to be a teacher and help transform society by ensuring every child has access to a quality education. Lydiah is a member of her school’s music club, which she really enjoys. She has represented her school at a number of music festivals and also serves as a member of the choir, which entertains and welcomes guests to all of the school events. Lydiah’s parents are both day laborers. Her mother has been ill for the last year and as such is unable to help support the family. Her father is now the sole breadwinner, and his earnings are not enough to feed the family and pay for Lydiah’s secondary school fees. If no help comes her way, she is faced with the threat of dropping off school after completing her class 8. Help Lydiah complete her education and achieve her goals by becoming her sponsor today!